In 1969 Dave Mahoney and I hitchhiked down to NYC to see Blind Faith. I really liked Traffic and was excited to hear the supergroup. I liked the alternate album covers and I liked their name. In Catholic schools I had religion class every day, a lot of hours to wrestle with questions of faith. It was never blind but I got the sense it was for some. Of course, some people blew the whole thing off. I was always struggling to understand and it was a lot to think about but I’m thankful for the experience. The religious overtones to the Camino have slipped away since we left the cathedral in Santiago. 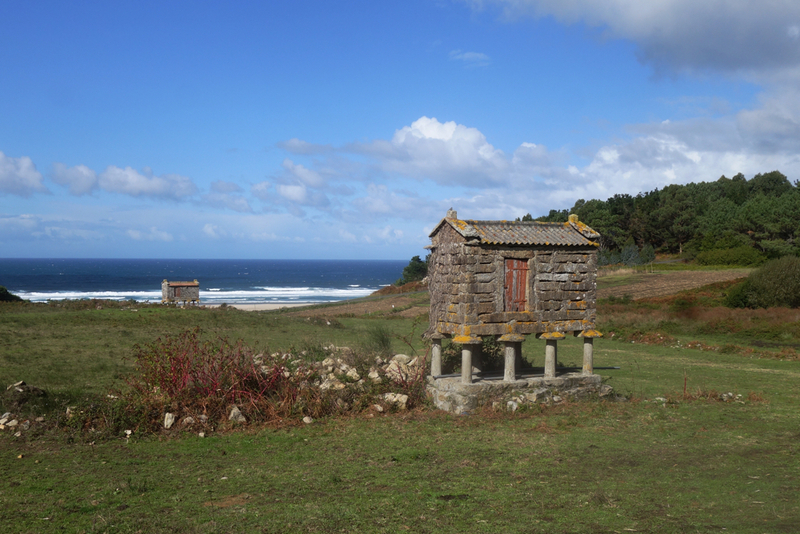 There are still Cruceiros in the small towns and a few shrines on the path but the four days from Santiago to Muxía are more like a walk in the park, the big Celtic park of northern Galicia. Walking the Camino gave me a deeper connection to the faith I was brought up in, the legends, the mysteries, the Saints, the martyrs and the miracles. I went in preferring Christ without the miracles. Then there is that thorny, direct-line between the nuns telling us the Jews couldn’t get into heaven because they didn’t accept Christ and the priest who celebrated our Pilgrim’s mass at the Cathedral in Santiago. He announced that Communion was “solamente para los Católicos. Separating us from them just like the Trumpster. As we climbed the hills out of Finisterra we passed the small church of San Martiño de Duyo. Voices were singing inside and a man was standing on the steps smoking a cigarette. We asked if it was a misa and of course it was. It was Sunday morning and the guy was probably waiting for his wife to come out. I wanted to be inside. Our Long Island Catholic Church had a LOT more mini-rules. You could NOT go to another religion’s mass , or you go straight to hell. If you brought a person from another religion to one of our masses , straight to hell ( STH ) . You could not attend a different religion wedding and vice versa , or STH . Definitely no marrying out of the religion … you know it ….. STH. How many times can I go to hell ? I have lost my talley sheet ! Maybe I have been instant Karma’ed ( uh-oh …. STH ) ….. I think they started my punishment early. Maybe I have so many infractions , they had to start early , before hell froze over ! One more comment . Notice the mini-house is balanced on eight mushroom shaped posts. There’s this store where the creatures meet , I wonder what they do in there , Summer Sunday and a year?